Moved house! My wife and I have shifted out of our old cosy/shoebox-sized apartment into a house a little further out of town. Means much more office-space and room for hobby stuff. The videogames studio that I run with my brother, Dinosaur Polo Club, has gone from three people to seven people. We’ve started work on two new titles, as well as spent time helping out two other studios. I also co-direct an annual week-long videogames festival, Play by Play. We ran the second one in April 2017 and the third in April 2018, and have begun planning for 2019’s. Turns out putting on a festival takes a lot of effort! Most of my time in 2017 and the first half of 2018 was very much focussed on the videogames side of my life, it’s only since Play by Play 2018 wound up in late April that I’ve been able to get back into miniatures. Stopped playing Malifaux. I might write more about this in future, but after five years playing Malifaux and spending a lot of time trying to grow the local community, I hung up my spurs and packed my fate deck away. I was struggling to keep up with the ever-expanding catalog of miniatures, the world wasn’t drawing me in any more, and I hadn’t been very happy with the art direction and the plastic miniatures that 2nd edition brought with it. I still have all my miniatures, I doubt I’ll ever sell them, but for now they’re just sitting on my shelf looking pretty. So long, and thanks for all the flips. Started playing X-wing. One of my core gaming group had been playing a co-operative campaign for the X-wing miniatures game with his kids and had really enjoyed it. We’d been looking around for what to get into post-Malifaux, we tried it out, and it’s been amazing! I played a few games of X-wing when it came out but didn’t really like it, but co-op against a pretty decent AI it’s a totally different beast. I ended up enjoying it so much that I bought a bulk lot of second-hand minis and have started playing it at the office. This ain’t even all of it! Most of the TIE fighters and Rebel snub fighters are sitting on a shelf at my office, awaiting every second Wednesday. Sold my Blood Bowl teams. They’d been sitting on the shelf for years and I wanted to raise some funds for the X-wing miniatures I hoped to get. So I brushed off the Saphery Magisters and the Norsca Under-17s, spruced them up a bit, and hocked ’em off on eBay. Nearly covered the cost of 90-odd second-hand X-wing ships. The Norsca Under-17s, my Khorne-themed Chaos team. Finished my Macedonians! I kept plugging away at this army and got it finished in time for ValleyCon in January 2018. Played four games, won one, lost one, and drew the other two. Had a great time and ended up taking home the award for best painted. I’m currently painting up even more of the buggers so I have some options and can field 450AP. By far the biggest hobby project I’ve ever undertaken. Not in a rush to start another 28mm DBMM army! Had to throw out most of my wild west buildings. Unfortunately the room I kept them in the new house was cold and a little damp, so the exposed MDF began to get mouldy. After a year of sitting in that environment they were positively toxic so I made the call to bin the lot. 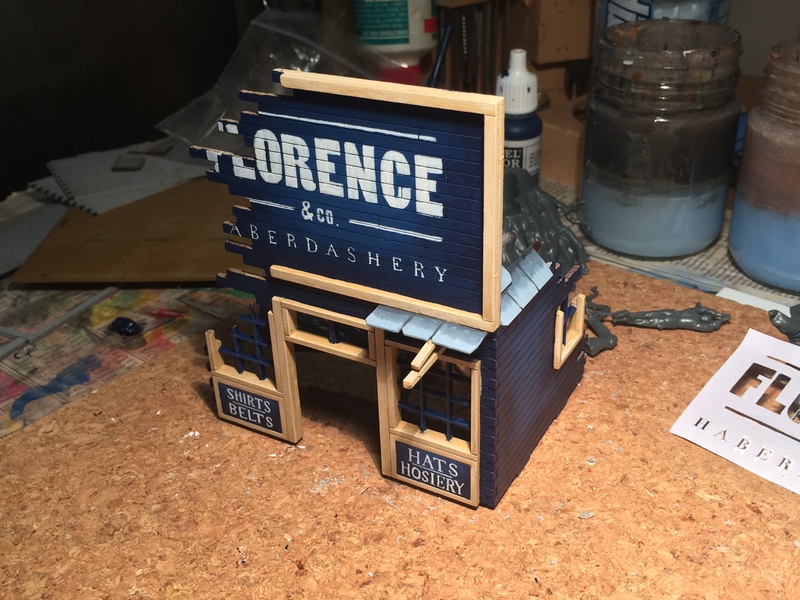 I’ve kept the one that I painted – “Florence & co. Haberdashery” – and will spend some time with bleach and a toothbrush to de-mould it. Got my Space Hulk miniatures back from Awaken Realms. I’m about 70% happy with them. It’s great to get the genestealers painted, but I definitely want to go over the terminators myself and do some extra detailing. I opted for cheesy second edition 40K colour schemes, I feel that they need to be brighter to really pull off the look. So right now I’m painting the last of my Macedonians (84 men and horses to go! ), next up will be tidying up the Space Hulk terminators, finishing the last few unpainted Malifaux and Infinity miniatures I have, plus I’ve got a small dungeoneering party on the way just for fun. I still have to get some proper DBMM terrain and start playing that regularly, alongside my weekly co-op X-wing games. I’ve found that most wargames follow a general rule: as the miniature count goes down, the terrain density goes up. Malifaux is no exception to this, so you need a reasonably-sized collection to put together an enjoyable game. Nothing as out-of-control as Infinity, just some buildings, obstacles, a few forests, some scatter terrain, that sort of thing. Terrain has traditionally been something I’ve lazily left to other people to provide, but a few years ago I thought I better stop freeloading and get some of my own. 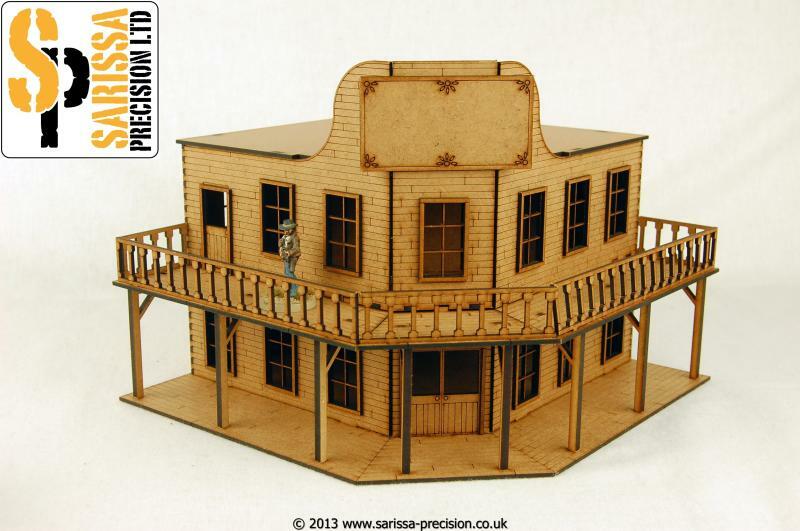 First stop was Sarissa Precision, purveyors of fine old west-style buildings. The Battle Flag Blackwater Gulch range also caught my eye, but they were too big, and much more expensive! I bought seven of their buildings and painted up four of them, invariably drifting off to some other project… so since then I’ve been playing on the same set of partially-finished terrain. 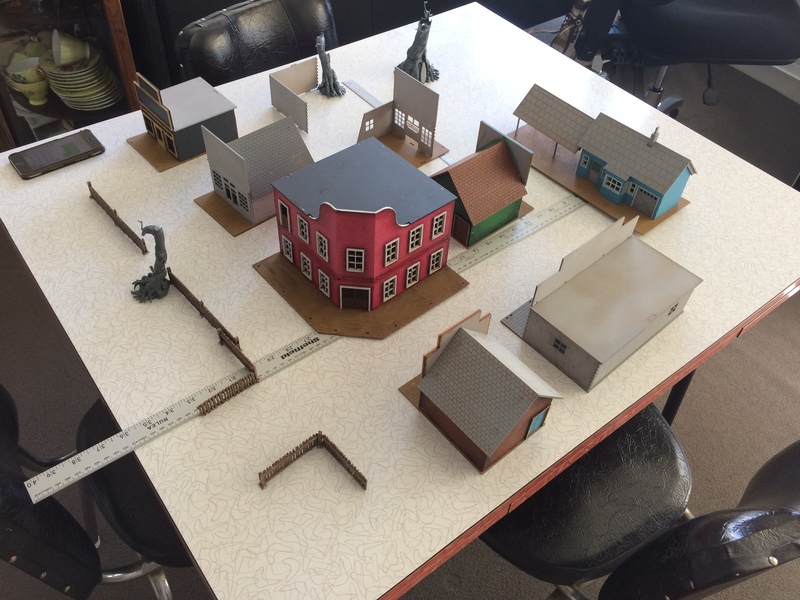 During that time I discovered that Malifaux isn’t that fun with large, clunky buildings. Even the smallest Sarissa buildings, which are only 10cm square, really clog up the board. I’m now glad I didn’t rush to paint all my buildings right away, as I don’t really like playing with them as is. My plan is to have an impact crater in the centre of the board, near the rear corner of the hotel, which has sparked the ruin of the town – while also nicely marking out the centre. Buildings provide most of the cover at 6″ and 12″. Two exceptions are the fence and “Welcome to …” sign on one edge, and a hedged and fenced railway line on the opposite edge. 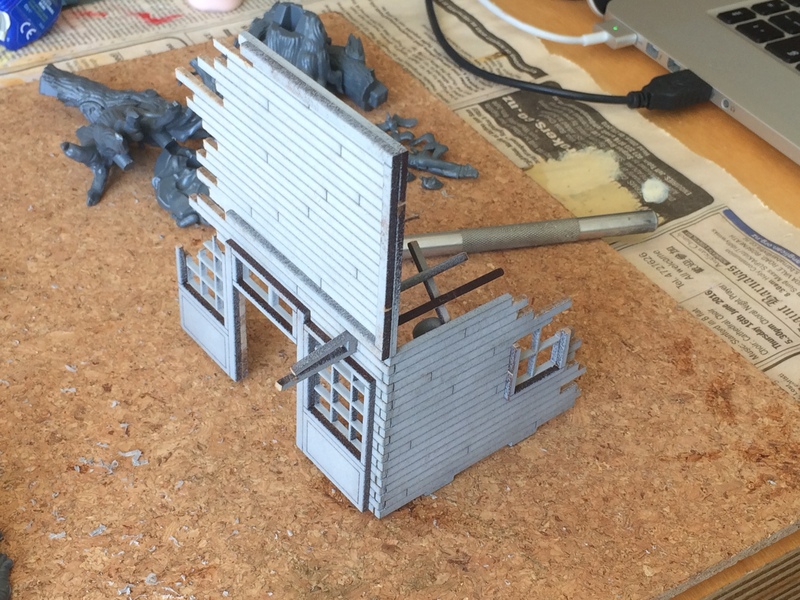 I’d just finished a block of troops in my DBMM army, and was going up to my parents’ place where I can use Dad’s bandsaw, so took the opportunity to test out my theory of how to turn a perfectly good Sarissa building into a ruin. Overall I was really happy with how easy it was to make – a bandsaw makes short work of MDF – and it’s still very sturdy even with the single join. I painted it the next day and feel like it came out really well. It was my first time stencilling and while it wasn’t perfect I think the rough-painted look fits the old west aesthetic very well. I printed out the top sign on paper and cut out the letters by hand with a craft blade. Next time I might try laser-cutting a stencil onto some thin material. The next job is to mark up the rest of my buildings so I can get them all cut next time I’m up at my parents’ place. I hope to report back in a few weeks with more finished buildings! Terrain: My usual: fairly open in the middle, scattered small soft and hard cover around the centre with a lot of blocking hard cover around the edges. My plan: Use my heavies to control one side of the centre to prevent a possible Inspection, while being close enough to score both the strategy and Show of Force. I assumed that he’d probably win the Extraction tussle so I had my Bayou Gremlins to charge in at the end of each turn to score my strategy points. How it worked out: I had a strong opening, by the end of turn two I had taken out the hanged and a desperate mercenary and had moved Gracie and Lenny into a threatening position to get into the centre the next turn. We were both scoring strategy points but as predicted Jack was able to move it further back into his own half. As there were no non-Master upgrades in the opposing crew Show of Force was quite simple to score. From turn three onwards it became a sprawling melée in the centre around the informant marker. We exchanged models for no great effect however I was having to shift more and more into the centre to get the strategy points. By the middle of turn four my position was looking very precarious – only Gracie was nearby and one Bayou Gremlin in range. Somer and the slop hauler were stuck in the backfield drawing the attention of a guilty and Jack Daw. They both managed to escape relatively easily (Jack failed to give Somer Tormented and the guilty pushed back into the centre). Somer used this opportunity to charge into the melée and managed to summon a pig after giving himself a crow and dispatching a wounded Desperate Mercenary with his pig sticker – the extra activation and significant minion in the centre of the board really tilted the game back in my favour, I don’t think I quite appreciated at the time how important this was! The last turn was very quick and just decided a the last few crucial VPs. Gracie had been neutralised for two turns by the nurse and in hindsight it was obvious that she was a target for Take Prisoner. I foolishly moved my last non-Tormented model away from her so Jack Daw was able to push Somer away (he’d been given Tormented by the guilty earlier in the turn), then moved in for the 3 VP capture. I finally got to use Somer’s Come & Get It! trigger! I’d always seen it as a bit of a gimmick, but if you’re able to get the crow with Do it Like Dis! and either focus or charge in (or hit someone reduced to 1 Wd already, maybe from Hard to Kill) then it’s a great way to get an extra body on the ground. Piglets are a real pain – Df 6, 5 Wd, – to Sh attacks, and having one in the right place can be critical. Something to think about when I’m low on models to contest something. I was pretty sure that he had taken Frame for Murder, the Trapper is always a favourite sucker model, so I should have ignored the trapper till after turn three. He was fairly inconsequential where he was so if I just left Gracie until after the Trapper had activated I could have hurled her into the centre for much greater effect – Lenny’s Ram and damage avoidance makes her nigh-unstoppable. Also towards the end of the game it was obvious to both of us that we’d both chosen Taken Prisoner. If I’d thought about it more it was obvious it was on Gracie – Jack struggles with her Armour, the Nurse had been nullifying her to keep her where she was, and he was pulling the Informant marker further away from her to keep her alone. Then in my last activation I handed him 1 extra VP by moving my slop hauler right away from Gracie. The hauler was only on a single Wd so was unlikely to have survived anyway but at least it would have meant a few flips! Modelling and painting miniatures is the part of the hobby that I spent the most time on by far. It can be a gruelling task, spending your evenings hunched over a small desk working on a never-ending pile of toy soldiers, but I find it’s always worth it when you finally get your latest model or army on the table. Like almost every other gamer, I’ve watched as my pile of unpainted miniatures has grown larger and larger. I’ve found that this was sapping my motivation – I’d buy something on sale (or, my eternal weak spot, a limited edition miniature) and add it to the end of the queue, then by the time I got to it I found I wasn’t that interested it any more. Kickstarter made this far worse but thankfully it only took me one big pledge to find that out. I felt bad painting something up straight away instead of getting through my old stuff first. 23 Terminators, 42 Genestealers, 1 Broodlord, 1 grail, and yes, 2 CATs. Don’t ask. So after all that, staring down the barrel of nearly 70 Space Marine Terminators and Genestealers has led me to the surprising decision of getting them professionally painted. Long ago I thought I would never become one of those barbarians who does so – what’s the point of gaming with miniatures that you didn’t paint yourself? This was another me in another time though, a me who had much more free time on his hands, and couldn’t care less if he spent every evening and the entire weekend painting (even if he should probably work on his essays for uni). I’m in a much different space now and I have other things I want to spend time on. I want to be able to spent my hobby time doing the things that I really enjoy, putting together models that I’ve only just bought and enthusiastic about, and not feeling guilty that I haven’t done my “homework” and cleared my backlog first. Once I made the decision to have them painted by someone else I felt a massive sense of relief. Besides my DBMM miniatures they make up the overwhelming bulk of my remaining backlog – 69 minis compared to about a dozen for everything else. I set about researching who I could get to do them, I wasn’t going to paint them myself but I still wanted them to look at nice as possible! After a few evenings’ research I settled on Awaken Realms in Poland. Their prices weren’t cheap, but pretty reasonable given their quality, and their example work looked very impressive. After a few emails with their team to confirm I spent a few weeks preparing the miniatures and looking up source material before shipping them off half-way around the world. I think I could handle my stuff looking this awesome. This really got me thinking about my hobby, and why it is that I paint. Do I really enjoy painting that much if it causes me all that anxiety? Or do I get stressed about because I enjoy it? Or is it just because it’s been a big part of my life it for 23 years and I can’t imagine not doing it? I’m so close to it that it seems I can’t think rationally about it, not being able to see the wood for the trees. At times it seems a little daft to think about it that much, but it is something I spend a huge part of my spare time doing so it’s worth taking it seriously. I’ll have a clearer idea once I’ve done two things: totally cleared my backlog (most of a DBMM army still to go…), and played some games of Space Hulk with miniatures I paid to have painted. I look forward to being able to report back. My plan: His lack of blasts meant I could bunch up and benefit from a bevy of auras, so I was going to move all my heavies up together popping heads and picking them up. Somer could be delivered safely to the other side of the board while I also took opportunities to exhaust the other crew. I didn’t give much thought to my opponent’s plans – might need to work on this! How it worked out: The board was quite odd and forced all the action to occur in one small area, the gap between the large rock and the barrels in the bottom right. This worked out okay for me at the start – Hayden’s emphasis on shooting attacks wasn’t that good for Headhunter so I was happy to bide my time there. The Desolation Engine came screaming in and Gracie only just survived thanks to her armour 2 and Lenny’s damage prevention. I was able to turn the Engine into a head marker and two abominations, one of which was exhausted and another turned into a second head marker. Things were looking pretty good. I lost Gracie and Lenny quickly thanks to Leveticus and the trapper. Leveticus was able to jump around a lot, I understood this in principle but hadn’t seen it before. Despite this I was able to exhaust him a couple of times (turns out when he dies he doesn’t lose it, useful!). His damage wasn’t as apocalyptic as I was expecting (praise be to the errata) however he did damage Somer enough to get below half-health which cost me a crucial VP. In the last few turns the damage dropped significantly, the only major event was me foolishly throwing Burt into Leveticus to try to exhaust him one more time. All this did was occupy a few more AP and deliver a head marker straight to the enemy. We were easily able to get into each others’ deployment zones and were too focussed on this to try to stop each other from doing so! Gracie with Lenny behind her becomes a serious tank. She was only taking 1 or 2 damage each hit from the Desolation Engine. If I’m taking Undercover Entourage, I really need to take some healing. One bad damage flip is all it takes to knock off at least 1 VP, if not all 3. At the moment I only have slop haulers, I could look at some lightning bugs. I finally got to use Somer’s Bigger Hat Than You. Amazing ability! Won initiative, used my high cards on Somer’s activation, and saved a high card to guarantee this action would succeed. Bayou Two Card meant I was still able to cheat (sort of) in defence and the rest of the turn went much easier on me because we each had no hand. Coupled with Survival of the Fittest it’s a pretty mean combo. Leveticus is incredibly mobile, but quite predictable. If I took something to take out the waifs *cough*pigapult*cough* it would be harder for him to get where-ever he wanted. If I’m sacrificing models in Headhunter, it has to be worth more than 1VP. Otherwise it’s only an even trade at best. Terrain: Fair bit of blocking terrain but a mostly open centre. Crews would be able to advance under cover but to contest the stashes they would be exposed in the middle of the board. My plan: Split up into two forces: Burt, Gracie, Lenny and a Skeeter on one side, and Som’er, Francois, the lone Bayou Gremlin, the Slop Hauler and a Skeeter on the other. Each would attempt to hold their stash marker. Burt, Gracie, and Lenny would aim to also take out Montresor and any minions they could. How it worked out: Burt, Gracie, and Lenny worked wonderfully well. They took out Montresor easily and one minion a turn while contesting the stash marker. Gracie was able to dance around a bit and get the boys into position, however she did get paralysed by the Nurse so didn’t have as much direct impact as she would have liked. Lenny’s immunity to conditions made him perfect against the Nurse and Hanged. Burt was just enjoying Lenny’s ram and hitting with 4/5/6 damage. On the other flank Francois went screaming into Ama No Zako in an attempt to kill both of them with Dumb Luck. It took a couple of turns, some soulstones, and some healing from the Slop Hauler but he did succeed eventually. The exchange was worth it as it nixed his Hunting Party. Jack Daw cursed Som’er and the Slop Hauler which decreased their effectiveness, especially when Som’er got paralysed by the Nurse. Luckily he was standing by the stash marker the whole time! At the end of turn 4 he just managed to remain on it despite the best efforts of Jack and the Crooked Man. We called it near the end of turn 4 as it was getting late and the outcome was fairly obvious by that point. Score: 6-4 win, probably would have been 9-5 at end of turn 5. Lenny, Burt, and Gracie make an amazing team with a ton of synergy. Main thing I need to work on is positioning Burt and Gracie so that he can pull her into combat with his built-in trigger. As she’s on a 50mm base it can be hard to get it to work. Skeeters are good at taking off the last few wounds off incorporeal models with Pull My Finger, however I need to remember that they can shut down triggers from 13″ away and this can be far more useful. If I’d done that to Jack on turn 4 it would have been impossible for him to leap around and threaten Som’er. Nurses are awesome and I can’t wait to get some into my Zoraida crew! Nurse/Lenny seems too good to be true.